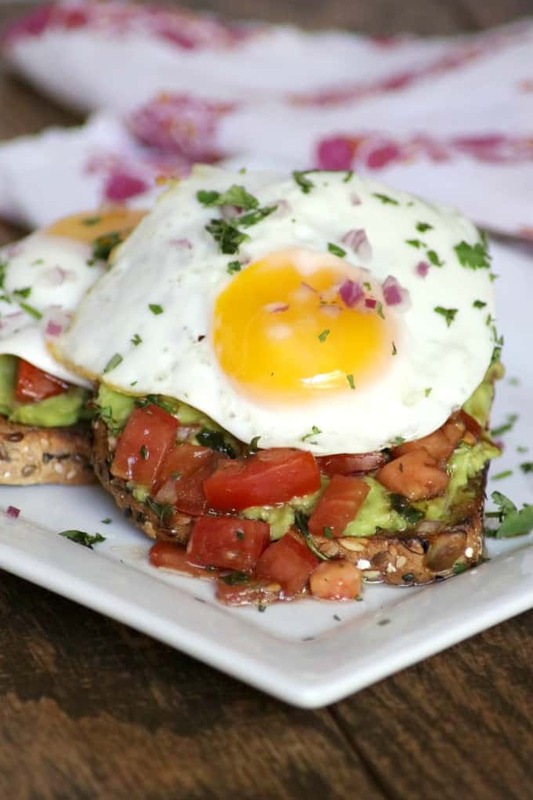 Wake up to this Bruschetta Fried Egg Avocado Toast! Whole grain bread, smashed avocado, marinated tomato and a fried egg are sure to give you what you need to provide you with a great start to your day. So when I originally did my 365 days of baking…. there was not ONE avocado used in the whole year of recipes. Up until the beginning of this year, I had never even purchased one! I never liked the consistency. I’m getting there. Baby steps, you know. So now, here we are, six years after I started the blog and I am really kind of hooked on avocados thanks to my daughter, Lexi. I honestly can’t remember where it started, but she had me buy them for her one day and slowly I began bringing more into the house. What can I say? 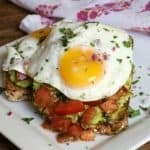 They’re super good for you, easy to eat, and go in a lot of recipes besides this Bruschetta Fried Egg Avocado Toast. When I made these Avocado Tuna Salad Bites, I seriously fell in love. Now I won’t eat my tuna salad any other way. My mother-in law told me that she loves avocado in her tuna salad as well! I love eating Avocado Tuna Salad Lettuce Wraps when I’m feeling I need a healthier lunch and want to cut out my carbs. The lettuce and tomato with the salad is fantastic! You can serve this Galaxy Salsa for all of those upcoming game days in your near future. Everyone loves it at our house! Avocados will also be delicious on top of these Loaded Huevos Rancheros. Why the heck did I not include them in that recipe? Definitely feel free to add them! I love eating this Bruschetta Fried Egg Avocado Toast in the morning. Every bite is full of flavor and I’m sad when it’s all gone. Since I’m on an avocado kick, I’ll definitely be add more recipes with avocado toast to my morning routine. This Everything Bagel Avocado Toast is next on my list! I love that Maria put cream cheese on it and can’t wait to make it. Melissa’s South of the Border Avocado Toast will be the perfect start to get me in the mood for a Taco Tuesday. It will even be a great breakfast for Cinco de Mayo! Fish lovers will adore Nicole’s Smoked Salmon Avocado Toast. This recipe will be perfect for breakfast or lunch! 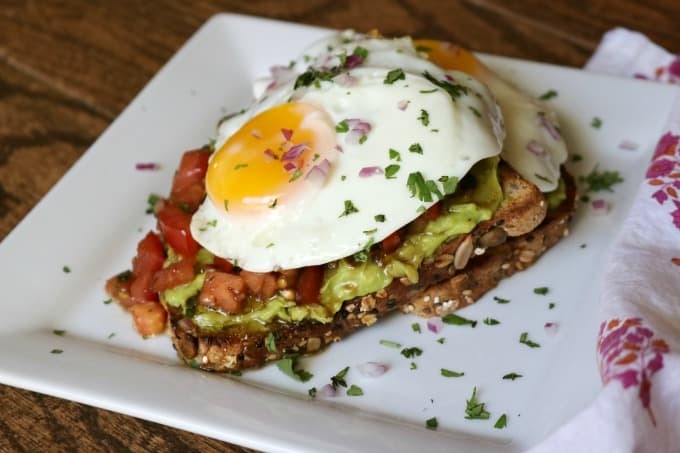 Bruschetta Fried Egg Avocado Toast with whole grain bread, smashed avocado, marinated tomato and a fried egg are sure to give you a great start to your day! In a small bowl, combine the tomato, red onion, basil, balsamic vinegar, olive oil and some salt and pepper to taste. Cut open the avocado and remove pit. Scoop into a medium bowl and mash with a fork. Add the garlic powder, and salt and pepper to taste. Mix well. Pour the canola oil into a non-stick skillet over medium-high heat. Add the eggs and fry for 2 - 3 minutes while gently spooning the oil over the tops of the eggs to set the yolks. Evenly divide the mashed avocado between the two slices of bread. Put an equal amount of marinated tomato on the toast. Sprinkle with additional fresh basil and red onion. I hope you all enjoy your weekend! Look for more delicious recipes next week! Here are some videos with tips on cutting avocados and more great recipes for them! Love avocado toast! Can’t wait to try this!